A carefully-worded marketing strategy or a new philosophy for 2019 – Ducati sent out its statement of intent through Mission Winnow. With Ducati being the first MotoGP team to present its 2019 line-up it created a platform to send out a statement of intent and a few warnings to its rivals. Ducati has been starved of world titles over the last decade with its last MotoGP crowns coming in 2007, the first year of teams being restricted to 800cc motorcycles, to see the Italian outfit storm to the riders’ and manufacturers’ championship with Casey Stoner. Since then the major honours have been shared between Honda and Yamaha but across the previous two years Ducati were genuine title contenders and in some eyes the favourite for 2019. 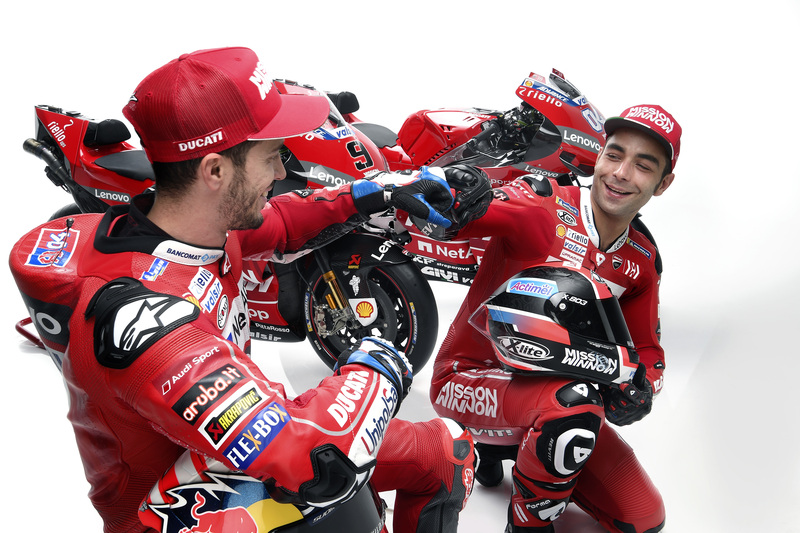 With the successful but combative Jorge Lorenzo being axed to see Danilo Petrucci provide a more constructive and collaborative pairing for Andrea Dovizioso, it’s clear that the rider with 10 MotoGP wins from the past 31 races (starting at the 2017 Italian round) holds Ducati’s hopes for the highly-sought world titles after back-to-back runner-up finishes to Repsol Honda and Marc Marquez. While sticking with Dovizioso – with backing in technical mastermind Gigi Dall’Igna – Ducati hasn’t lost too much sharpness to its frontline even with the departure of Lorenzo but the key philosophy changes inside the team could prove pivotal. That’s where Mission Winnow comes in. Or at least its idea. Ducati’s team launch was used as a stage for the Philip Morris International marketing strategy which made its motorsport debut with Ferrari at last year’s Formula 1 Japanese Grand Prix, accompanied with a curious Kimi Raikkonen haiku book, and minus any Petrucci poetry or Dovi discourse the same Mission Winnow mantra was revealed with its logos front and centre on the GP19 livery. Without nit-picking the PMI marketing spiel, which would have undoubtedly needed word-by-word clearance from the firm’s legal team to avoid breaking tobacco sponsorship rules and global legislation, the mantra was simple: to winnow is to only keep the useful parts and remove the rest. This isn’t to say Ducati has picked up its new racing strategy from one of its largest partner’s marketing ideas, but the theory was laid out clearly by CEO Claudio Domenicali when assessing the company’s vast “investment” in Lorenzo, speculated to be close to €15 million per year, which failed to meet targets in terms of race results but did provide gains in other areas - keeping the useful parts and cutting out the rest. “The investment was really big but so was the benefit,” Domenicali said. “Jorge was very good in making us understand some areas of the bike that needed improvement. An important part of what we progressed was thanks to him. While there’s no doubt Ducati will have a smaller wage bill without Lorenzo, it is believed the level of investment into the team’s MotoGP efforts remains just as high but this time the investment has been put into what Domenicali described as “areas of the bike that needed improvement”. The levels of investment were noticeable in the standout part of Ducati’s team presentation which came from the Italian squad’s technical section that had an openness and level of detail higher compared to what a typical launch event may reveal – i.e. not a lot. Fronted by Dall’Igna, Ducati brought out Aerodynamic Development manager Edorado Lenoci who presented a series of shots to demonstrate the team’s investment in the area before being followed in the same vein by Davide Barana, Technical Director, explaining Ducati’s Desmodromic valve system. While eye-catching and impressive, nothing in the presentation would have caught its MotoGP rivals by surprise. But what could cause concern is what else Ducati and Dall’Igna are cooking up behind closed doors in Bologna. Swingarm torque bars and new rear seats components were just some of the new tech toys on show last November and talk of an “all new” bike for the Sepang test was also teased by Dovizioso during the launch. Not every new trick may work as intended, that’s why MotoGP teams test after all, but referring back to the Mission Winnow method the parts which are successful will only move Ducati further to the front in terms of performance. A similar sentiment applies to Ducati’s change in rider strategy which moves away from “two riders who think independently”, according to Dall’Igna. “I'm not talking about team orders, but I'm talking about the synergy in the development of the bike, and in the setup of the bike during the race weekend,” he said. The change is clearly something Dovizioso is relishing as he feels he can work with Petrucci rather than against another rival who will solely target the world title. “When you have a good relationship, it's easier to do everything,” Dovizioso said. “I'm happy in the situation we are in now. I think Danilo is completely open to try to work together. It seems to have also struck a chord at top management level with Domenicali keen to tell the assembled press that Ducati, with continued backing from parent company Audi whose logos were also emblazoned on the GP19 livery, are in MotoGP to win with its revised approach. Less of winning at any cost but winning at the right cost, where finance is invested in key areas to allow the Italian manufacturer to find an edge on what Domenicali described as Ducati’s “giant” Japanese rivals. “We have 150 people in the racing department that do it every day, they are winnowing every day, to separate the good and the bad,” he said. “We have a close relationship between the race and the production people which is very positive. Marketing strategy aside, Ducati wants to take all of its lessons learnt from recent campaigns and maximise its potential in 2019 without wishing for a magic formula or throwing all money and resources at one problem. With Ducati learning to win again, the next test is learning to lead a MotoGP world championship and dealing with the new pressures it brings by embracing the good and not concentrating on the bad. 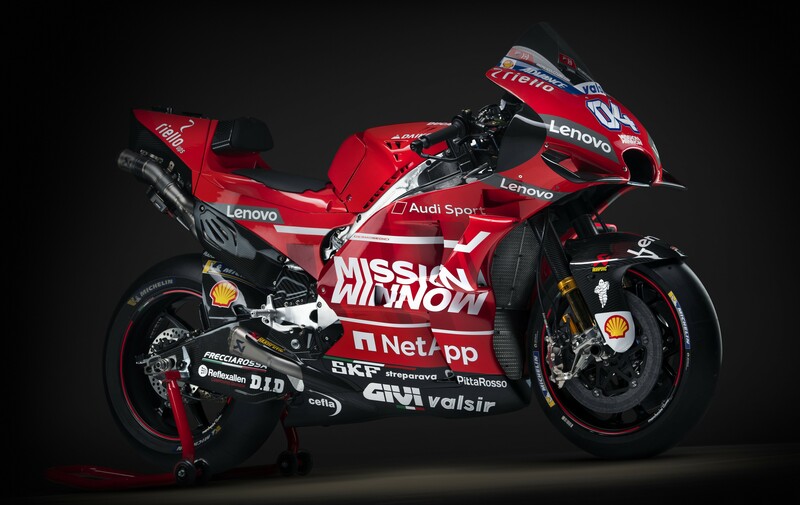 And as many eagle-eyed onlookers mentioned, Ducati’s 2019 target was plain to see: Mission Winnow – Mission Win Now.